Find artworks, auction results, sale prices and pictures of Theophile Alexandre Steinlen at auctions worldwide. 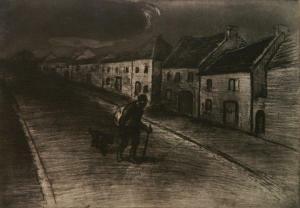 Theophile A. Steinlen (Swiss 1859-1923)- ''Chemineau Traversant un Village Endormie'' (Crauzat 69 iii/III)- soft-ground and aquatint, 1902, signed and dedicated 'a Eug Delatre' in pencil, very very faintly light struck. 13 7/8 x 19 3/4'' Exhibited: No. 803 of Forgotten Printmakers of the 19th c. Kovler. Sale 2498 Lot 305 THÉOPHILE-ALEXANDRE STEINLEN (1859-1923) [L'HIVER, CHAT SUR UN COUSSIN.] 1909. 19 1/2x25 3/4 inches, 49 1/2x65 1/2 cm. Condition B+: creases in margins and image; minor repaired tears at edges; time-staining in margins; vertical and horizontal folds. 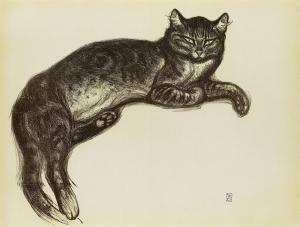 This reclining feline was used both in Steinlen's print, L'Hiver, Chat sur un Coussin and for his poster for the Deuxième Exposition des Artistes Animaliers. This is a one-color proof before letters. Crauzat 517, Bargiel / Zagrodzki 50 (var). Theophile Steinlen (1859-1923) Swiss (three) Lot 0155 DetailsShipping & PaymentAuction Terms & InfoLot 0155SONG SHEETS, three color lithographs, all signed on the stone, sheets 10 ¾ x 6 ¾\”, all framed with glass. (3)ConditionOne toned and with two dog-eared corners, one with tear lower center in text, third with pale toning, otherwise all in apparently good aged condition. Three plates from Les Maîtres de L'Affiche. c.1895-1900. Lithographs in color. Imprimerie Chaix, Paris. Publisher blindstamp l.r. Sheet, approximately: 15 5/8" x 11 3/8" ++ Steinlen, Théophile Alexandre (French, 1859-1923). "Le Coupable." 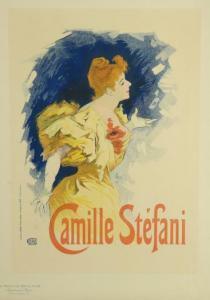 From "Les Maîtres de L'Affiche," pl. 134. ++ Guillaume, Albert (French, 1873-1942). "Ambigu Comique Gigolette." From "Les Maîtres de L'Affiche," pl. 30. ++ Cheret, Jules (French, 1836-1932). "Camille Stefani." From "Les Maîtres de L'Affiche," pl. 93. Condition: Near fine condition.